You could say this is a case of a horse race breaking out in the middle of a fight. Jockey Freddy Jose Manrrique-Guerrero has been suspended 30 days and ordered to attend an anger management class by Will Rogers Downs stewards for an altercation with fellow jockey Natalie Turner in the stretch run of the final race of the recent meet. 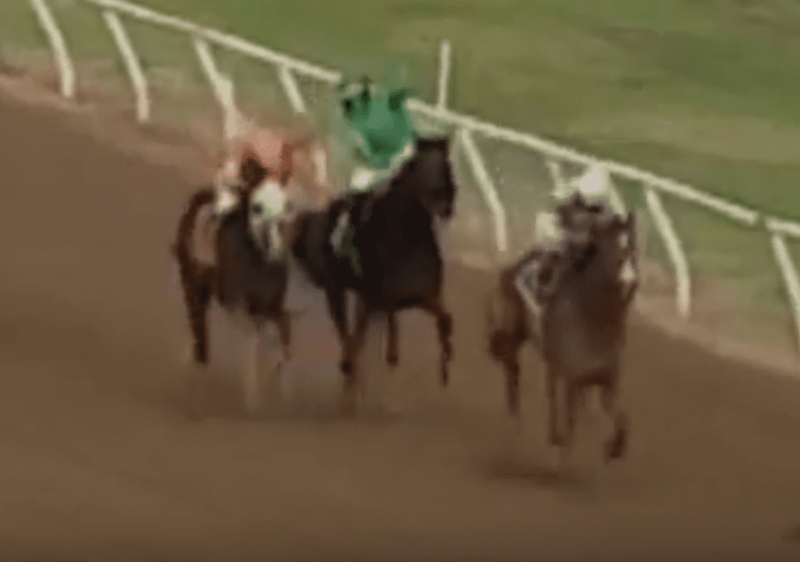 In a video replay of Saturday's 12th race (below), Manrrique-Guerrero, aboard Oliver G, is seen making contact with Turner, riding War Chirp, heading into the stretch. Moments later, with the riders side-by-side in close quarters, Turner flails her whip at Manrrique-Guerrero three times. The chart notes of the incident read: WAR CHIRP… was placed in tight quarters entering the top of the stretch exchanging light contact with Oliver G and coming close to that one's left-handed whip, attempted to strike that rival with the whip appearing to make contact on at least one occasion, then went evenly. OLIVER G… crowded WAR CHIRP a bit leaving the turn and was put to a left-handed whip in very close quarters to that rival, then finished up evenly. War Chirp, a 15-1 chance in the $26,400 allowance race, finished fifth, beaten 7 1/2 lengths. Oliver G, the 2-1 second choice, was half a length back in sixth. Manrrique-Guerrero pled no contest and waived his right to a hearing regarding the incident. The stewards ordered him to provide a certificate upon completion of the anger management class. This is the second recent suspension for Manrrique-Guerrero. He was suspended April 18 after being charged by Claremore, Okla., police with possession of a controlled dangerous substance and unlawful possession of drug paraphernalia. According to records, the suspension was lifted May 7 after Manrrique-Guerrero provided stewards with a negative test for controlled dangerous substances. This entry was posted in Racing, Videos and tagged Freddy Jose Manrrique-Guerrero, Freddy Manrrique, Horse Racing, jockey altercation, jockey altercations, jockey fight, jockey suspensions, Jockeys, natalie turner, Scott Jagow, thoroughbred racing, will rogers downs by Scott Jagow. Bookmark the permalink.